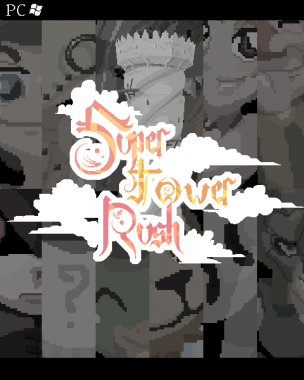 Super Tower Rush, brought to us by the talented development duo Team Super Tower Rush, (@ToenAndreMC – Artwork and Audio, @MissScriptor – Programming) is a local (and soon-to-be online) competitive multiplayer platform-racer, with several unique twists. 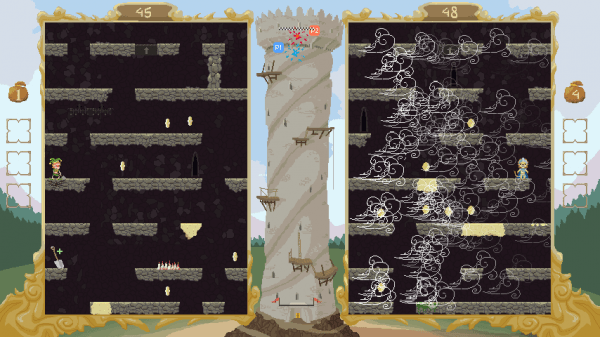 Players must navigate tall towers brimming with traps, spells, pitfalls and bonus items in an attempt to beat their opponent to the bottom, and it’s pretty cut-throat to boot. This game was clearly built to bring out the “competitive sibling” style of play in all who engage with it, and in this sense alone, it succeeds in every regard. Expect food to be thrown, controllers to be batted out of hands mid-play and great amounts of strategic wind passing. All of which will frequently punctuate your local multiplayer sessions. Although this is the core selling point of Super Tower Rush; the party aspect, what separates it from other titles in the indie world is the overall sense of polish, of genuine 90s charm. Although a Story Mode is in development, the game in its current form is clearly one focused on providing players with the most engaging arcade experience possible. If looking at the Single Player Arcade Mode, we’re immediately presented with a multitude of characters to pick from, each possessing a unique ability. This immediately screams “replay value” in the gruff, succinct tones of seasoned classics such as Tekken. The controls, character movement, and load times are fluid and responsive and the player seldom feels a negative sense of nostalgia – specifically the frustrations that often accompanied having to work with an 8-bit machine. Although nearly all aspects of the gameplay are immensely enjoyable (and this is heightened to the nth degree when you leave the Single Player Arcade Mode and take on a human opponent in local multiplayer) I do have to pick at one thing: The spikes. The spikes of certain key-smashing frustration and lengthy respawn times. But even this is by design and works perfectly in the creation of those genuine “C’mon!” moments that local multiplayer games are typically known for. 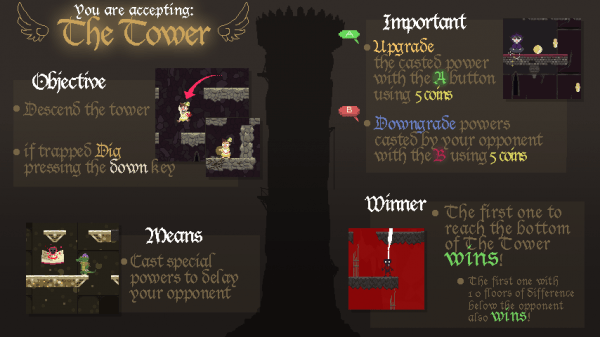 Essentially, Team Super Tower Rush have done an excellent job in transporting us back to a time when gaming was simpler, where all that was required was time, an understanding of the controls, and sheer will; the days when games were impossibly hard as standard and if the power went, so too did all of the day’s work. The in-game features compliment this totally, the spells (weapons/power-ups used to slow your opponents) have a distinct Mario Kart feel. The dissolving blocks of sand that aid your descent feel very Zelda-esque and there’s definitely a visual nod or two in the way of Kirby’s Dreamland. This game is quite simply the Indie lovechild of everything we enjoyed about 90s gaming and a great deal more. By emulating the classic 8-bit graphics of titles such as LoZ: A Link To The Past, Super Tower Rush communicates a deep respect for titles of old. To look at the practical side of the visual style, you’ve got to talk frame rates. The technical benefits of using 8-bit visuals become apparent to players pretty quickly, especially when things get a little heavy. The Alpha copy I was looking at had no issues with a steady 80 fps and saw no drops whatsoever. Now this, for me, is where the game shines brightest. Nothing makes a retro themed title more enjoyable than a well mastered retro soundtrack, and that is exactly what Team Super Tower Rush have offered. And I suppose this is where I have to get a little soppy, as whilst I was playing this game with a close friend, I couldn’t help but feel a deep sense of loss. I used to play countless SNES and N64 titles with my older brother. My brother and I were one of many pairs of siblings that grew up, and grew closer, facing the same TV screen during the 90s. The competitive aspect was integral to the bonding experience. I say this because Super Tower Rush brought all of those memories flooding back, in nostalgic droves. The key reason for which was the masterfully written soundtrack. If an independent publisher can transport players to the ‘way-back-when’, well, that’s saying something profound. 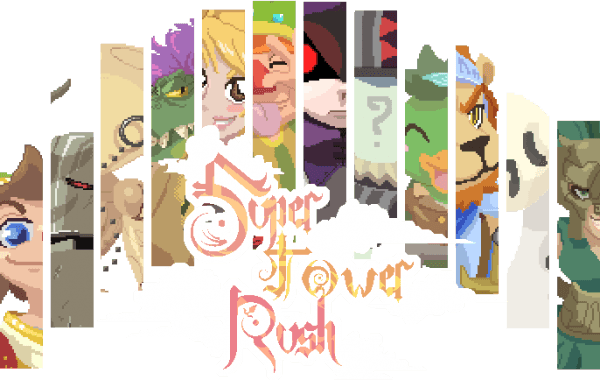 Super Tower Rush combines everything we loved about the 8-bit classics of the past, and sends gamers careening back into that era, by choice or otherwise. It’s a guaranteed nostalgia trip with a good few modern surprises, and for $2.99, you’d have to be nuts to say no to this one. Personally, I’d pay $2.99 just for the soundtrack. Oli is a creative writing student, drummer, Pink Floyd nut and avid gamer. You can often find him amidst a pile of PC parts or perched questionably on a drum stool.